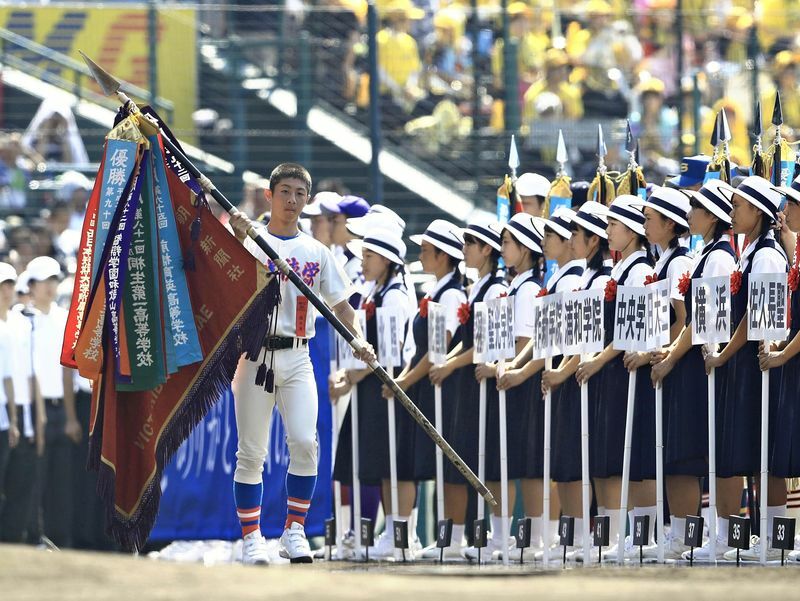 The Yomiuri ShimbunHanasaki Tokuharu High School’s captain carries the flag of the National High School Baseball Championship on Sunday during the opening ceremony of the 100th tournament at Koshien Stadium in Nishinomiya, Hyogo Prefecture. Crown Prince Naruhito and Crown Princess Masako attended the ceremony. The 100th National High School Baseball Championship will start at Koshien Stadium. A total of 3,781 teams have taken part in regional tournaments. A record 56 teams were given berths to play on the field of dreams to commemorate the centennial championship. It is hoped that they will play exciting games that live up to the expectations placed on this milestone championship. Many memorable games that went down in history have been played at the summer national tournament. The 1969 championship final between Matsuyama Shogyo and Misawa High School could not finish in one day after their score was tied, forcing a rematch. That game is now the stuff of legend in high school baseball history. In the 1998 Yokohama vs PL Gakuen game, Yokohama pitcher Daisuke Matsuzaka threw 17 innings by himself in an extra-inning game. The 2008 final between Waseda Jitsugyo and Komadai Tomakomai, which featured a pitching duel between Yuki Saito and Masahiro Tanaka, ended in a draw, leading to a rematch. This final must also be engraved in fans’ hearts. Spectacular performances by players at Koshien have nurtured the dreams of children who followed and contributed greatly to the promotion of baseball. The number of high school hardball baseball club members has been declining. While the number of large-scale clubs with more than 100 members has increased, that of clubs with fewer than 10 members has tripled in the past decade. Thus there is a growing polarization. There are some high schools that have difficulty carrying out practices due to a shortage of club members. The number of combined teams consisting of members from multiple high schools that compete in regional tournaments has increased. The summer Koshien tournament continues to assume an important role in spreading the charm of baseball for the future. The Japan Sports Agency has taken the initiative in reexamining the way extracurricular activities should be conducted. Abolishing long hours of intensive practice, such as conducting activities even on Saturdays and Sundays, and instead achieving results efficiently in a limited space of time — such a trend seems to continue to strengthen. Coaches are called on more strongly than before to devise ways to enhance the quality of practice. Since high school baseball uses the single-elimination format, care must be taken over measures to prevent injuries. It is necessary to assess the conditions of individual players, conduct regular inspections of shoulders and elbows and provide appropriate nutritional guidance. Efforts to protect players and cultivate their potential will hopefully prevail among the coaching staff. This year’s tournament will take place in record-breaking summer heat. Not only the players but also spectators are called on to take preventive measures against heatstroke. A tiebreak system will be introduced for the first time in this tournament from the middle of the extra innings. To help reduce the burden on pitchers who have to throw in consecutive games, it will be imperative to increase the number of days off and set game starting times flexibly.